On a Kabul football field marked with white chalk in readiness for sport, a woman in a burqa kneels, her shadow spilled before her. A man approaches almost casually, his Kalashnikov pointed heavenward. She half-turns toward him in a fearful gesture, her left arm raised slightly, then seems to glimpse the weapon out of her peripheral vision and turns away. He lowers the muzzle to her head. The rifle kicks as he fires once, then twice more. She surrenders to the ground, a discarded blue handkerchief. I can still picture with precision the smuggled video I saw on the Internet in November 1999. The version that ran on the AP wire had no sound, only silent violence. To be party to such a stark and intimate moment, I knew far too little about this woman. Her name: Zarmeena. The number of children she had: seven. Her alleged crime: beating her husband to death with a hammer as he slept. And one more fact: her husband’s family had forgiven her, though it was not said why. Considered together, it amounted to a scattered detail or two, not a life story, not a revelation of what may well have been an act of courage. This absence of narrative, in fact, was true for nearly all women in Taliban-held Afghanistan: they were gagged as well as hidden. This private recognition spurred a sympathetic curiosity about the country, leading to repeated visits, unexpected friendships, the founding of the Afghan Women’s Writing Project dedicated to Zarmeena, and eventually the novel What Changes Everything. I wanted to write about war without the soldiers, without the battles, war as I came to know it from my years as a journalist, as a long black ribbon that unfurls in the wind, crosses continents and brushes someone’s cheek as she sleeps in a peaceful city so far from the frontline that it should be someone else’s nightmare. Though Afghanistan provided the spark, What Changes Everything is an American story. It is the story of Clarissa who, in a gamble to save her husband’s life, makes decisions in the dark nights of Brooklyn, NY, boldly defying the advice of US authorities. And of Stela, who owns a used bookstore in Ohio and writes letter after letter in hopes of comprehending the loss of two sons, one to death and the other to estrangement. Of Mandy, a nurse from Texas, who travels to Kabul on her own personal relief mission—though ultimately, the relief she seeks is her own. It is the story of Danil, a Brooklyn street artist whose life has been derailed by this war half a world away. And of Todd, a career aid worker who let down his guard on an ice cream run and then must confront his worst fears. The lives of these characters, touched by the same black ribbon, become braided together. But it also tells of two Afghans who exemplify the complexity of their country. One is Najibullah, president of Afghanistan during the Communist era who was held captive at UN headquarters in Kabul until invading Taliban forces tortured and brutally executed him. The letters from him to his three daughters that separate the novel’s sections are imagined, though I had the privilege of email exchanges with one daughter, who shared pages of recollections of her father. The other is Amin, a fictional character who as a boy tried and failed to save Najib, and now risks his own life in a drive to help Todd. Afghanistan refuses to be simplified. Its women are not all victims, of course; its men sometimes support their wives and daughters above all else. Equally, our national relationship to Afghanistan is dense. Our history is plaited with theirs in ways that will continue beyond the last decade of war with its staggering investments of life and aid. 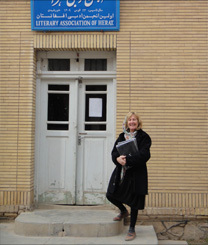 My personal link to that country, too, has been multifaceted—first as feminist, then as journalist, novelist, and now as Director of Communications and Public Diplomacy at the US Embassy in Kabul. Writing What Changes Everything was not a choice; it was a need. It is dedicated to those who were changed: their everyday lives are only sometimes located in the combat zone; their numbers are larger than any statistic can reflect.